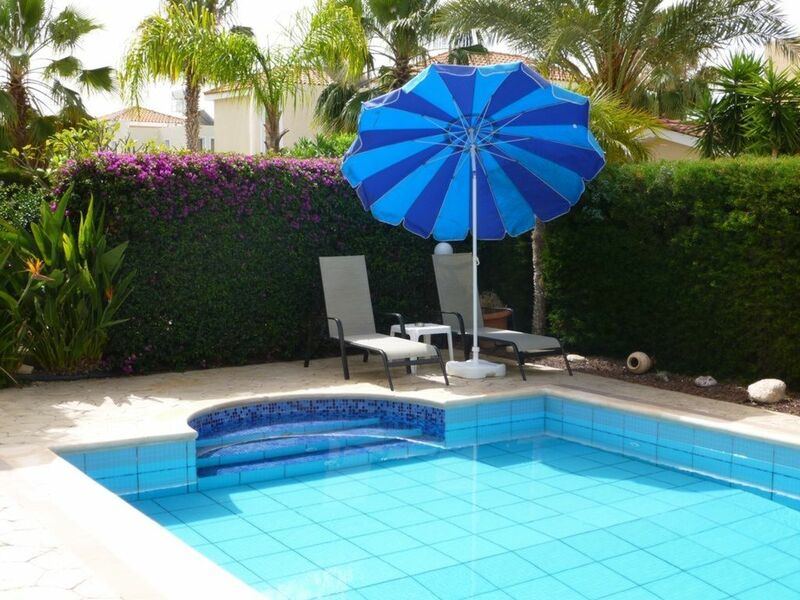 Fully equipped luxry private villa with secluded private pool, in heart of Coral Bay. Located in a quiet cul de sac with no through traffic, minutes level walk to the main strip with bustling tavernas, bars and supermarket, and a short walk to the award winning famous blue flag beaches. Fully equipped to reflect its the second home of the owners who spend several months out of season in the villa. Large secluded garden, pool with Roman steps for easy entry or just lazing on. Extensive shaded terraces with external lounge and dining furniture, BBQ, under cover table tennis table. Covered parking on private drive, keeping your car cool. 3 en suite double beds with bath to ground floor. Seperate cloak room to ground floor. Shared balcony overlooking pool to 2 bedrooms, plus private balcony to master suite. Ground floor bedroom patio doors to sitting area/ garden, providing level access to the drive/ Street. Newly fitted kitchen with beautiful granite worktops and sink, induction hob. Leather sofas to seat 6+, 50 inch TV, with BOSE soundbar which has Bluetooth for connecting to your music, internet access to UK and international programmes. Log burner for the winter. Bose CD radio player, 4 USB charging sockets. All windows have fly screens. The owners are an English professional couple, now retired, who spend several months each year in the villa so ensuring its of a standard and level of comfort befitting their second home. We bought the villa due to its fantastic location, so close to the main strip and beaches, a short drive or bus ride to Paphos, and large plot, so we can spend time tending the beautiful gardens when not laying in the pool or indulging in our passion of table tennis. A real home from home. We completely refurbished the pool, enlarged it’s size with Roman steps, installed pool heating for the winter, a log burner, and finally renewed the kitchen so that the hvilla is exactly as we would want it had we built it from scratch. In 2018 we fixed permanent shading to the main outside terrace. The master en suite bathroom has been completely renewed in winter 2018 to a lovely standard, with an LED lit mirror, the cloakroom completely refitted also with an LED mirror and the other 2 bathrooms have been upgraded. Large comfortable sofas and arm chair, 48 inch flat screen TV, log burner, ceiling fan and AC, 4 usb charger sockets for phone, iPad, laptop. Induction with extractor fan over. Bose radio/ CD player and Bose sound bar to TV with bluetooth, separate BOSE radio/ CD player. Large balcony from patio doors from the 2 upstairs bedrooms, with tables and chairs, overlooking pool, plus private balcony to master bedroom , private own sitting out area to downstairs bedroom. With walk in Roman steps that you can sit on and simply laze in the pool, solar pump for constant water circulation and filtration in daylight hours so less noise and a cleaner pool. High chair and cot provided. Children love the villa and the pool. Standard reflects its the owners second home that they spend several months in each year, and continually improve and update.